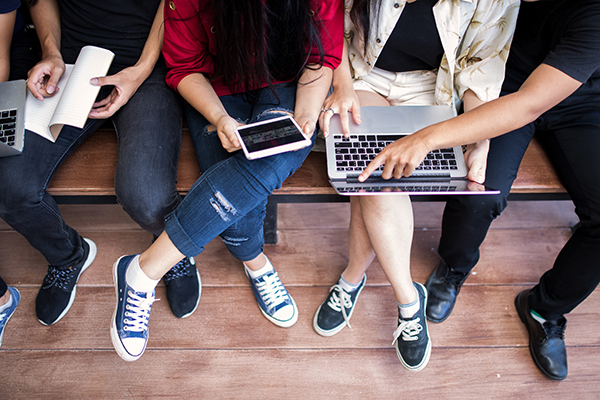 Cloud use is on the rise with some of the latest surveys showing that 39 percent of applications at colleges are cloud-based, and the number is expected to rise to 62 percent by 2021. Video use in higher education is also on the rise, meaning implementation of cloud video is a good way to embrace convenience and meet demand with the latest technologies. Video is becoming central to online learning in a variety of settings. Academies, such as lynda.com and udemy.com, have gained popularity by providing video materials and real-time video lectures instead of textbooks. Advantages of video include user-friendly delivery, especially on mobile devices, and easy access across platforms and browsers. While there is still growth potential for the use of cloud-based video, its use in higher education is widespread in supporting distance learning, video conferencing, simulation, and more. In higher education, students are no longer tied to their textbooks or even computers. With virtual labs, online assessments, and video conferencing, students and instructors don’t have to worry about geographical distance. HB Communications has worked with UMass Amherst School of Nursing and New York Law School to implement video conferencing technology which utilizes the cloud. Courses are available on demand, which means time is less of a constraint or commitment. Students who are remote, homebound, working, traveling, or contending with other demands can still take classes and receive degrees. In the past, receiving a quality education meant students must live on, or travel to campus to attend lectures, classes, and events. Cloud video has changed that as students can now log into their accounts at any time from anywhere and receive instruction not only from their professors, but access classes presented by remote professors, guest lecturers, and experts in their area of study. Save time and money. Once transfer costs are paid, a pay-as-you-go system is possible. Attract a broader range of students. Greater flexibility and access means the institution can serve more students. Serve students more efficiently. Students can access cloud-based video services via mobile or at home, using their own resources, equipment, and spaces. As with all newer technology solutions, cloud video comes with new challenges. Schools face issues such as how to handle network considerations or train support staff to maintain these new systems. And, like with all industries, schools must contend with risks to security and privacy. Education breaches increased 103 percent in the first half of 2017 over the previous six months. Fortunately, there are ways to protect a school’s data with multi-layered protection solutions. Another consideration with cloud video is downtime due to Internet connectivity issues. Since an institution’s offerings will depend on the reliability of the connection, obtain the most reliable service possible and consider using a secondary service as a backup. The key to success for cloud-video services in higher education is finding a reliable, scalable, easy-to-use solution that works with existing technologies and that offers the necessary quality needed. HB implements secure cloud solutions that work on their own or integrate with on-premise technology for hybrid deployment models. HB consulting engineers will help to choose the best option while weighing the balance between cost, security, and previous technology investments.